I’ve been a bit quiet recently, with one thing or another, but luckily I’ve had lots of helpers to keep exploring my local landscape. I’ve been contacted by my friend Rachael (who helped out on the project last summer) to say that she wanted to do something special after handing in her Thesis and finishing her exams at the University of Aberdeen. I was delighted to hear she wanted to cycle the 50Km Rhynie Man Way with one of her best friends, Anastasia. She has very kindly written about her trip and sent some photos (taken with film) and Anastasia has written a lovely piece of creative writing. I’m so pleased that people want to explore this beautiful landscape on my behalf and have been inspired to write about what it means to them. 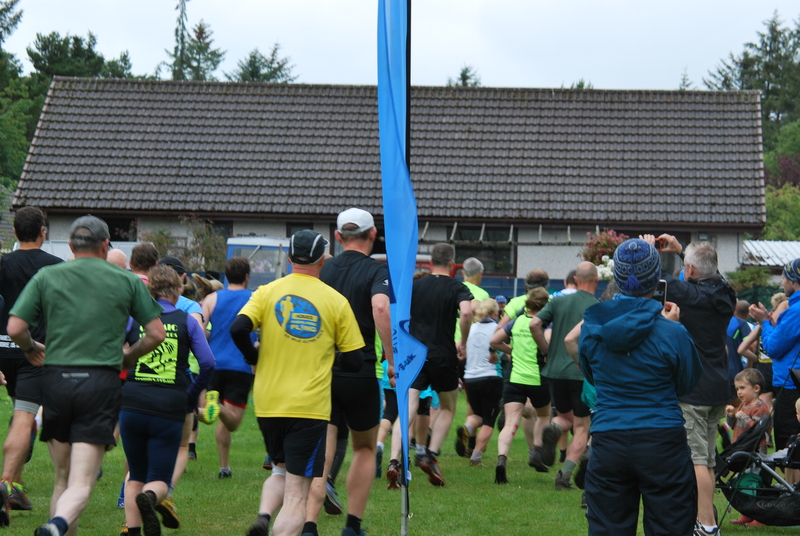 Please let me know if you make the journey along The Rhynie Man Way and if you share your journey on social media please use the hashtag #TheRhynieManWay . Having worked a bit with Anne and Rhynie Woman last year, and being a keen cyclist, I have wanted to cycle Anne’s Rhynie Man Way for a while, and a few weeks ago, with my friend Anastasia, I finally did. We planned to set off early on Saturday morning so decided to go the day before to pay a visit to Rhynie Man in Woodhill House. The following day we agreed to meet bright and early at 7am. The weather was a bit damp but we didn’t let that deter us. As the route more or less follows the River Don, then the River Urie, and finally the Gadie Burn before going ‘cross country’ to meet the Bogie in Rhynie, it seemed appropriate to start at the mouth of the Don. From there we cycled through the picturesque Seaton Park and along Tillydrone Road to join the National Cycle Network Route 1. This takes you through Woodside along the old station road. As the day went on we became aware that, as well as the rivers, we were also following the railway, which we frequently crossed and which reminded us of its presence with each passing train. Our next symbol stones, at Dyce Church, sat very close to both the river and the railway. 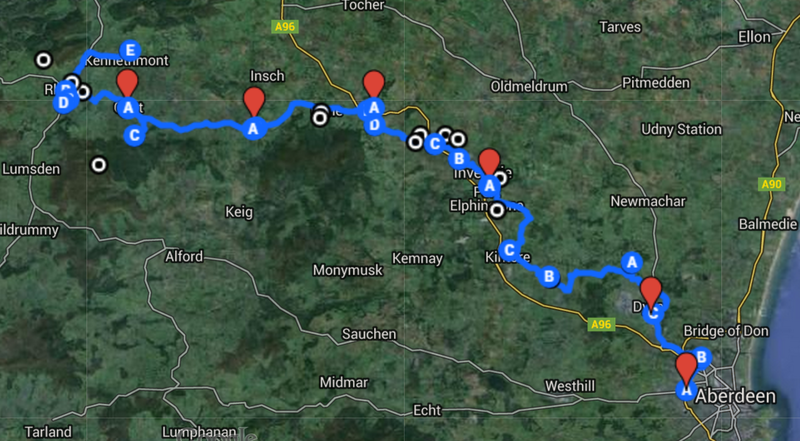 Following this, we headed on down Dyce Drive, finally realising that my navigation had gone a little awry when we reached Kirkhill Industrial Estate and Aberdeen Airport, not quite the quiet country lanes we’d been in search of. We retraced our steps, or rather our revolutions, and refound our way. Kintore was our next stop where the symbol stones in the churchyard were quite easy to find once we’d been pointed in the right direction by a local fisherman. Cycling up out of Kintore we got an amazing view of the Don Valley and Inverurie appearing below. 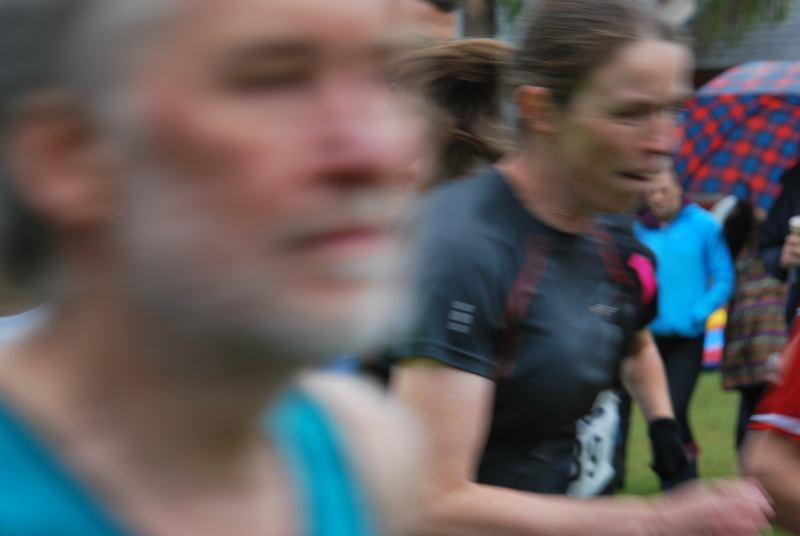 Everything seemed to be going well and the sun was even coming out… But then disaster struck! Anastasia’s chain had broken so she couldn’t peddle her bike. Thankfully, we were at the top and could happily freewheel most of the way into Inverurie (unfortunately by-passing the stones at the Bass at the Old Churchyard, Inverurie as we whizzed past) where we were grateful to discover the Pedal Power Bike Shop where they were able to fit a new chain. At this point we decided we’d earned our lunch so we enjoyed our picnic in the square in Inverurie, followed my Millionaire’s shortbreads from the bakery. We were well set up to continue. On our way out of Inverurie we stopped off at the famous Brandsbutt Stone and admired its Ogham inscription. Then we continued our journey to the perhaps even more famous Maiden Stone. Far bigger than any of the others we had seen and bearing many more symbols, both Pictish and Christian, it was easy to understand why. It was quite magnificent. And we enjoyed reading the local myth – featuring bannocks, Bennachie and the Devil – about how it had come to appear. I was also chuffed because reaching it on my bike meant ticking off my first checkpoint on Cycling UK’s British Cycling Quest, something I’d been meaning to do for a while. Our final stone before arriving in Rhynie was one built into the wall surrounding the churchyard at Clatt, one that we never would have known was there if I hadn’t already visited it with Anne last summer. We were pretty knackered by this point and, lying down on the grass to admire the stone, we were tempted to take a little nap. Buoyed on by the thought of a warm welcome in Rhynie and some Rhynie Woman pizzas, we continued, and made it! My name is Anastasia Cojocaru and I have just graduated from University of Aberdeen with a degree in English and International Relations. I enjoy reading and writing so I joined the AU Creative Writing Society in my last year as an undergraduate student (2015-2016). I developed a lot as a writer there and I met like-minded individuals but I took Creative Writing classes before joining this group. The initial version of the piece I have sent you was written more than a year and half ago for a Creative Writing course at the university in third year and is based on my very first childhood memory, growing up in rural Romania with my grandpa in the summer. I adore cycling in Scotland in the summer and my trip with Rachel to Rhynie inspired me to adapt the initial version of this piece and turn it into a blend of Scottish-Romanian memories. That morning I woke up and searched his side of the bed with my left hand. There were only cold sheets touching my skin. The room was already covered in light. It was an enormous room which had a table and a bed which was far too large for just a child and a man. There was a blanket on one of the chairs. The cat slept peacefully on the woollen red and from time to time the wood crackled in the stove which smelled like baked mushrooms. I could feel the heat of the fire on my face. Outside, I ran barefoot to the edge of the forest behind our house hoping that he would be there, somewhere between the tall trees which looked like emperors of the endless greenery. I could feel the dew on my feet and the sun playing with my hair. Our cottage looked so small from the outside. Sometimes my eyes lost its sight between the hills, when I looked at it from the distance, on my way back to the city. I stopped at the edge of the forest and shouted at the top of my lungs: ‘Grandpa!’. I got no answer so I returned to my room. I knew a long and painful wait was about to come. I closed the door with a hook and crossed my arms. Everything had an unpredictable feeling to it. For the first time it was just me and the bright early morning. I looked through the windows at the hill covered in gorse in front of our house. Most of our sheep and their lambs were still asleep in their sheepfold, on the meadow at the base of the gorse hill. I could see the mountain covered in violet heather in the distance. Could he be on top of the mountain? He must be as small as an ant. That’s why I can’t see him. This was my first summer in Rhynie with grandpa. He came back at noon. In the morning he used to pick mushrooms that grew during the night. His basket smelled like earth, grass, and damp leaves. A student at Gray’s School of Art has attempted to get under the skin of one of the country’s most enigmatic figures as part of her Masters project. 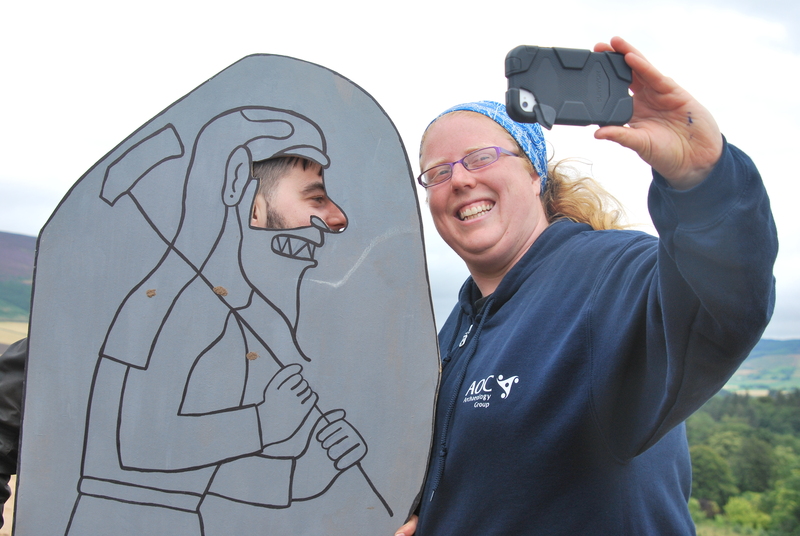 Anne Murray, a creative practitioner about to finish an MFAContextualised Practice degree at Gray’s, has created a 21st century persona, complete with blog, Twitter account and film, for Rhynie Man – the name bestowed on a six-foot tall Pictish stone carving of a warrior discovered in the Aberdeenshire village in 1978. 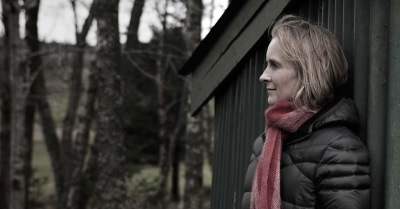 The project, which was launched a year ago, has seen Anne working to raise awareness of Rhynie Man – which stands in the Aberdeenshire Council headquarters at Woodhill House in Aberdeen – among the local community via social media channels and engagement with local schoolchildren on various arts projects. She has also created a map of the area which highlights areas of historical significance and set out on a ‘pilgrimage’ tracing a route from Aberdeen to Rhynie as a way of marking the stone’s spiritual return to the village. 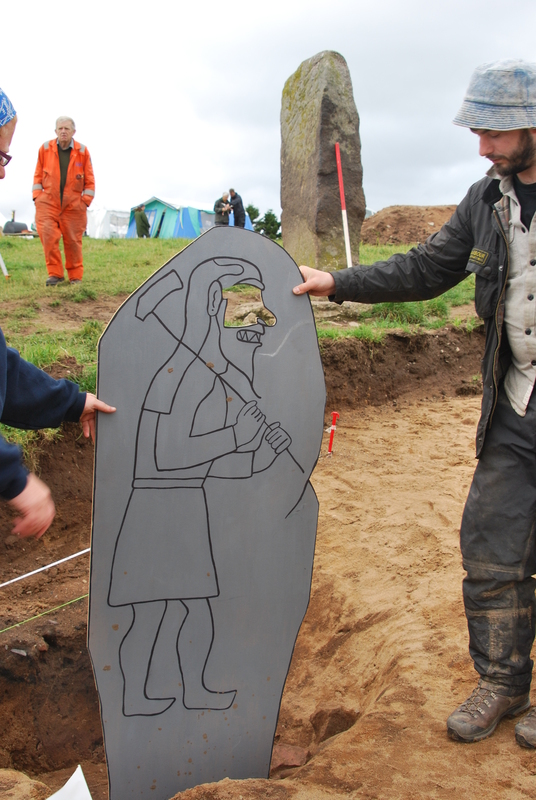 An archaeological dig is currently on-going in Rhynie as part of the bid to discover more about the stone’s origins and the significance of the site. 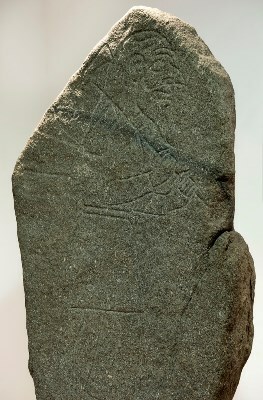 Anne said: “We know very little about the Picts and it appears they used other means of communication such as their enigmatic symbol stones. 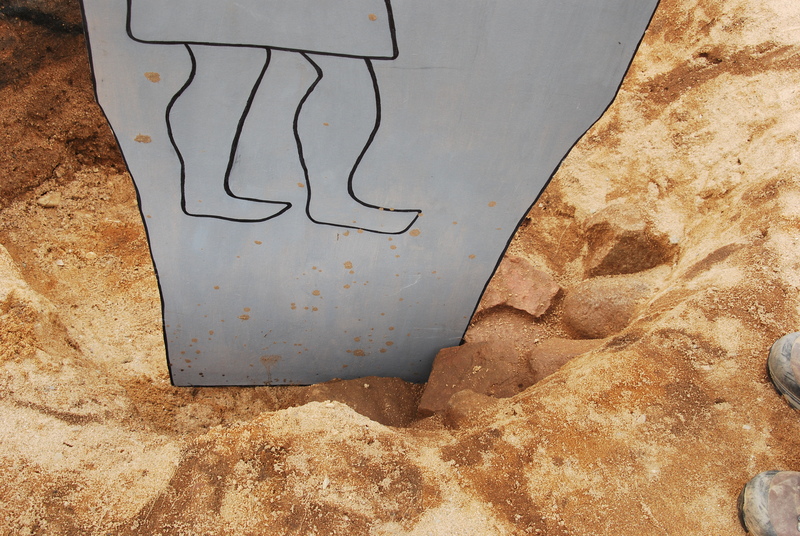 Archaeologists are at an early stage of learning about them and this creates the opportunity for artists to be creative and playful. “Working with the artist collective Rhynie Woman and Aberdeenshire Council, I first set out to create a stronger presence for Rhynie Man in the community and help create awareness of the stone and its significance. She added: “The route that I am walking as part of Rhynie Man’s spiritual journey home takes in a number of other standing stones with carved symbols. A stop motion film – ‘Rhynie Man: The Movie’ – created by Anne to tell the story of the stone was screened in the village on August 31, which posed an open question to the community. Anne’s work is currently on display at Gray’s School of Art as part of the ‘C³: Collaborative Contextual Conversations’ exhibition showcasing a range of work by current full and part time Masters students. The show runs until Friday, September 11. On display as part of the exhibition are a number of objects linked to the project, including a hand carved staff, the laser etched alms and the stop motion film. Another couple of busy days on the dig site. Most interesting for me, the great excitement when a Cattle jaw was found in the terminal/stone socket. Once again the wooden Rhynie Man Lookie-likie came out and prove to be a very good likeness. Thank you to the @NorthernPicts for the photo – have a look out for them on Twitter and Facebook for more updates and follow the #REAP blog here. The number of diggers more than doubled today with the primary school’s annual visit to the dig site. The children were met with a huge container full of spoil to sift through and find lots of interesting things. They were also interviewed by Fiona Stalker, radio presenter from BBC Radio Scotland – have a look out for the photos on the Northern Picts facebook page, here’s a sneak peek of one of our young at heart local volunteers getting involved. Listen out tomorrow on BBC Radio Scotland “Out For The Weekend” Friday August 28th 2-4pm for more information about our open day on Saturday 29th August 2015 at 10 – 4pm. Keep up to date with all the activities and events on Saturday by following the Rhynie Woman Facebook Page and twitter @therhynieman Hope to see you there! 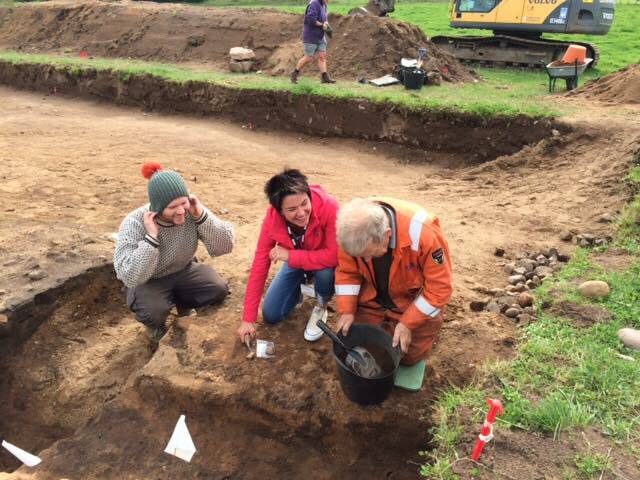 Visit to the dig site and some (potentially) very exciting news!!!! 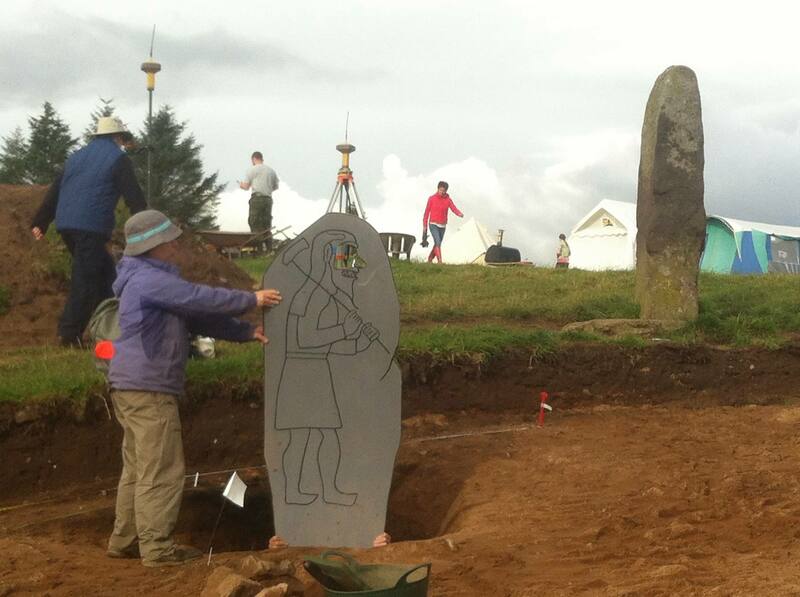 A flying visit to the dig site today to introduce some University Lecturers to the Art of Archaeology and Rhynie. The tour took in the proposed cycle route between Aberdeen and Rhynie visiting a few of the Pictish Symbol Stone sites on the way. Thankfully it was lovely weather and we arrived to see Rhynie Woman Daisy picking Yarrow to put on top of the now famous pictish pizzas. 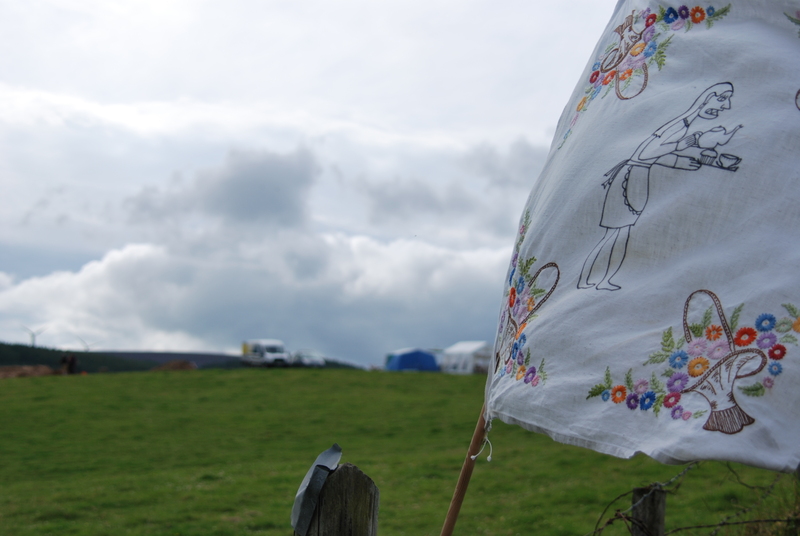 The site was easily spotted with the great signage and flags. We found Rhynie Woman Debbi and Rachel busy preparing dough and the Pizza Oven. Whilst the kettle was whistling and the oven getting up to temperature we had time to have a quick guided tour with the archaeologists. 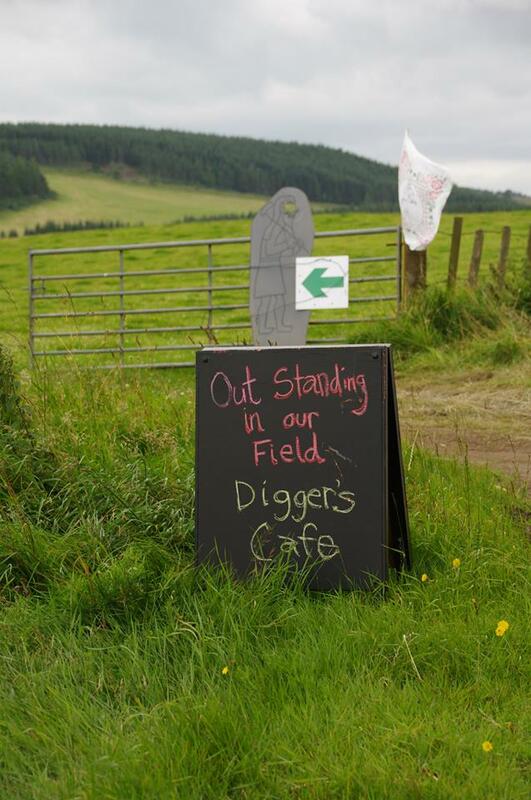 We met with DrGN and he introduced us to the background and context of the site and the series of digs that have been taking place in Rhynie over the past 5 years. As we started to smell the aroma of pictish pizza there was a lot of activity around the dig site and we took a closer look! 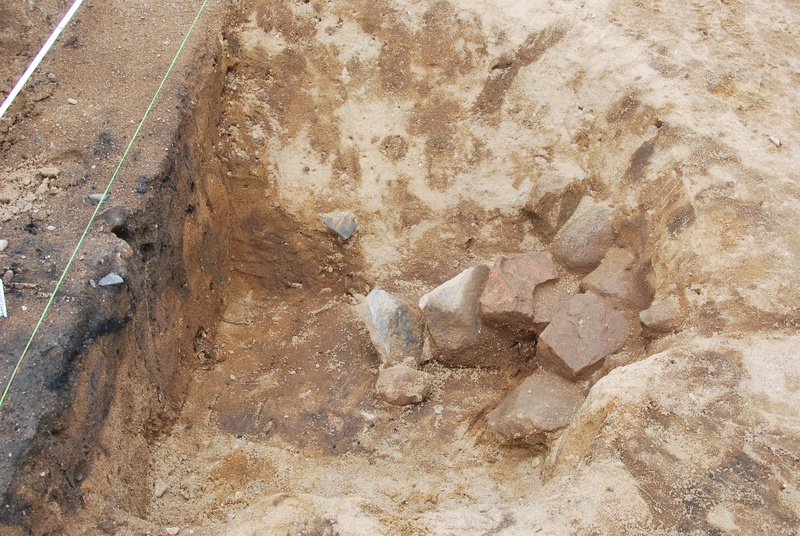 Now the archaeologists tell us that this amount of stones is VERY unusual on this site, there are signs of a fire and something possibly being removed from this socket….now what could that be? Archaeologists don’t want to speculate but they can’t help wonder if the socket held up something heavy, large and potentially kite shaped. I wonder what that could be. and that handsome face! No it’s not Fred, but Me! who’d have thought. Well it is important to remember we don’t know for certain, and I’m keeping quiet on the matter, but I’m sure the archaeologists will be measuring and calculating things over the next few days with a view to establishing whether this could be the socket hole of Rhynie Man. Wouldn’t that be amazing!!!! There were some more interesting behaviours and use of material culture being demonstrated on site today. I’ve observed a large increase in this kind of behaviour over recent years; the raised arm, the heads inclined towards each other, the cheesy grins and after the event the discussion of whether it is tweetable or suitable for facebook. On this occasion it was a definite positive reaction. No doubt the image will be found online and around the world quite soon on a computer near you. Here is recorded an image of the ‘selfie’ as the event is called. I would recommend further study of this behaviour. Further updates will arrive over the next few days, but from what I saw today there are some really exciting finds starting to emerge including a stone that looks like it was used to polish leather as well as potentially other crucible and amphora shards. 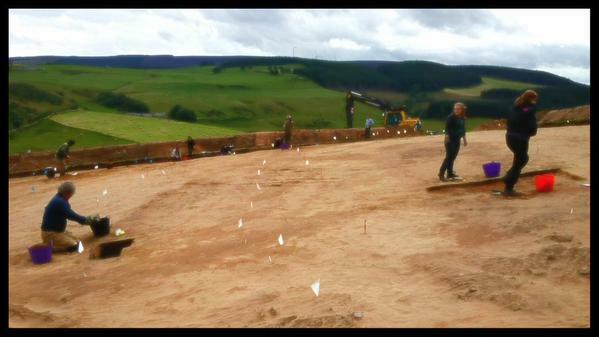 The archaeologists have busy on the site and there seems to be even more flags. 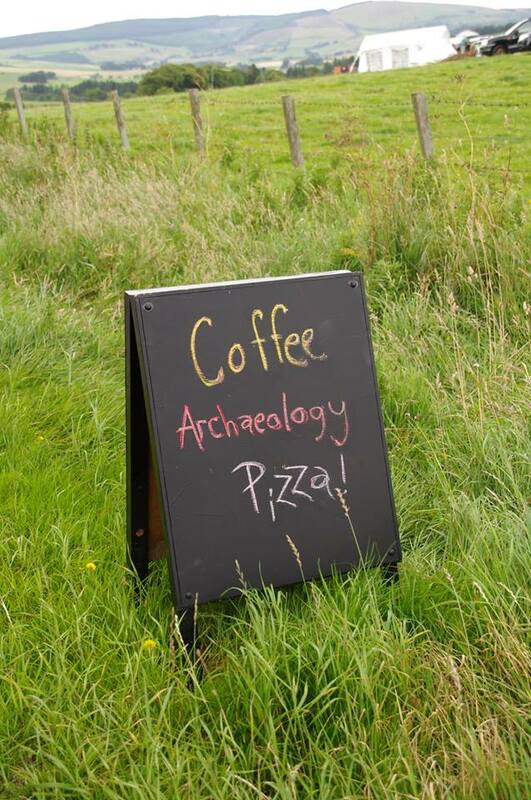 The pop up pictish cafe is now open for visitors until next Saturday, so pop along between 10 and 5pm every day with tours at 2pm. David’s fine carving of meeee! everyone sifts their own bucket! 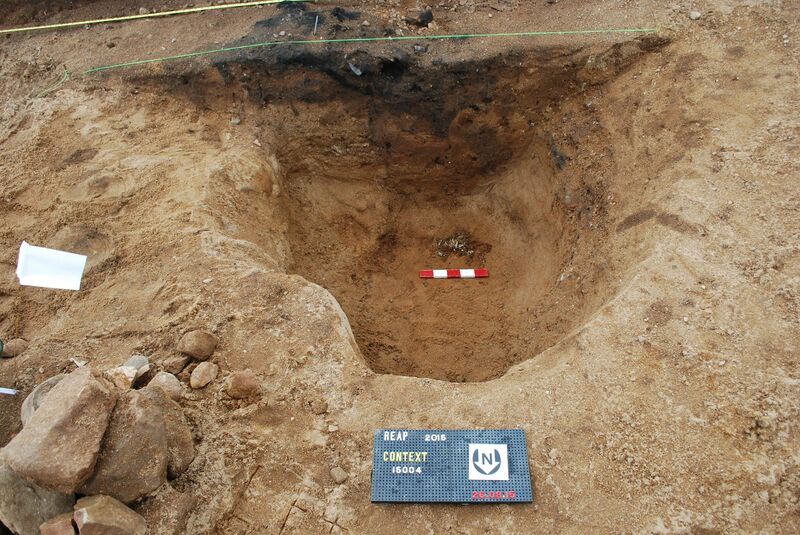 The dig in Rhynie is gathering momentum and Dr GN and his team of intrepid archaeologists and volunteers have been clearing the site around where I was found. The media is just starting to pick up early promising indications that there are interesting features to be found and as they work their way through victorian coins and pottery there are more things to be found. One thing they would like to find out is where I was situated!!! My bolt hole, if you like. keep all your fingers and toes crossed that they find it and I can finally get an idea of where my cold toes were placed in the warm Rhynie soil.